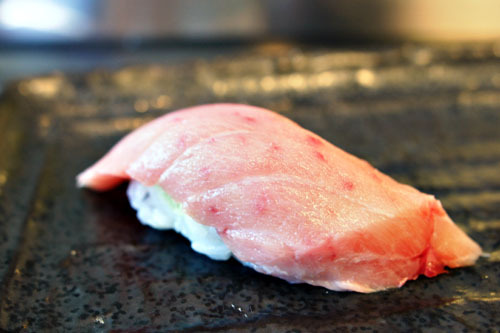 To tell the story of Sushi Shibucho, we have to examine the history of that other Shibucho, the one situated in the Westlake neighborhood of Los Angeles. The O.G. Shibucho on Beverly was opened way back in 1976 by Sakae Shibutani, making it one of the earliest sushi restaurants in the area. Shibutani-san (a.k.a. Shibuya-san) did well enough there to allow for the opening of a second location in Little Tokyo: stall #317 in Yaohan Plaza (now Little Tokyo Galleria) at 333 South Alameda. However, due to the stresses of running two restaurants concurrently, he sold the original Shibucho to one of his employees, Shige Kudo, who still runs the place. In 2000, Shibutani-san ended up selling the Downtown eatery to one of his employees as well, a fellow named Kawasaki-san. 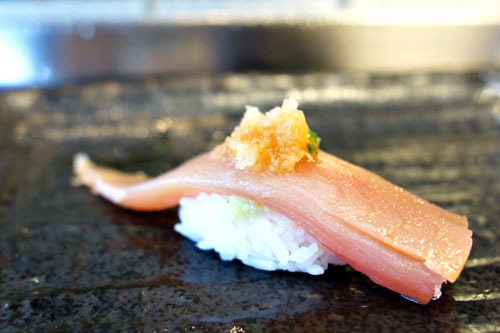 As such, the restaurant was renamed Tsukasa Sushi, which in turn was rechristened Sushi Bar Kawacho. Kawacho would transform into the well-regarded Sushi Go 55 in September 2004, and Kawasaki himself would stay there until late 2006. 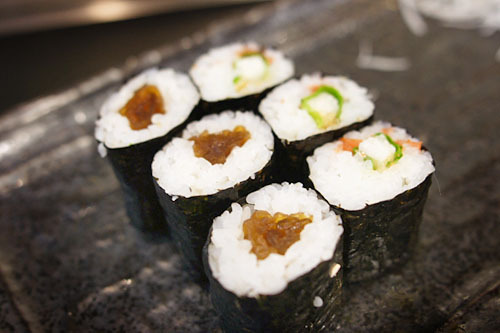 Shibutani subsequently moved back to Japan to train his son, Naga, in the art of sushi, and in 2002, the two came back to the States, opening the current Sushi Shibucho in Costa Mesa. Given that we were going omakase with Naga-san, we didn't see Shibucho's regular menu. 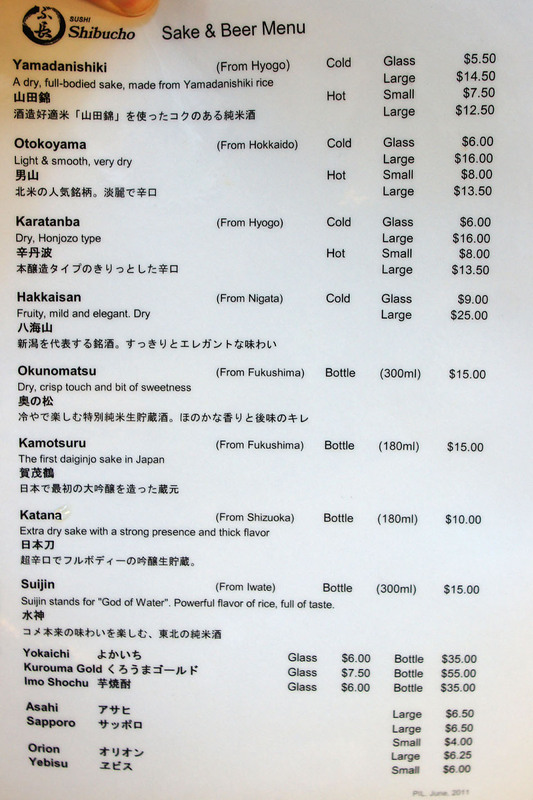 However, we did peruse the restaurant's sake and beer selection. Click for a larger version. 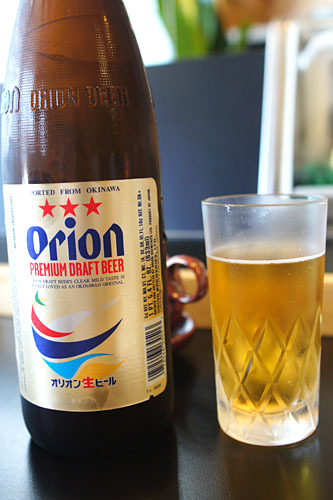 We started with an Orion Premium Draft Beer [$6.50], sort of a prototypical rice lager from Okinawa. 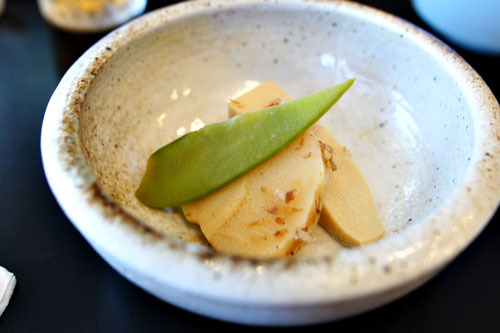 To start: a simple duet of crisp, crunchy bamboo and soft, pillow-y tofu, both enrobed in sweet, umami-soaked flavors and accented by the comparatively bright relish of the snap peas. 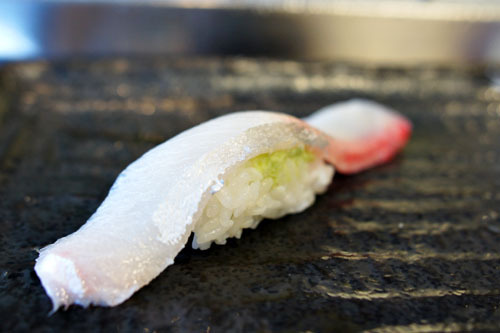 Our sushi gauntlet began with two types of tai: one unsauced, and one brushed with yuzukosho. 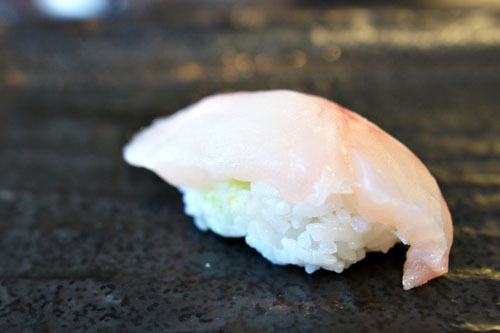 I tasted the naked snapper first, and quite appreciated its toothsome texture and wasabi-tinged taste. It, however, paled in comparison to its neighbor, which showed off a delightful saltiness and pepperiness that did a perfect job in balancing out (but not overwhelming) the fish. Up next was a pretty much faultless cut of tuna--textbook taste with a silky, supple consistency. Nice. 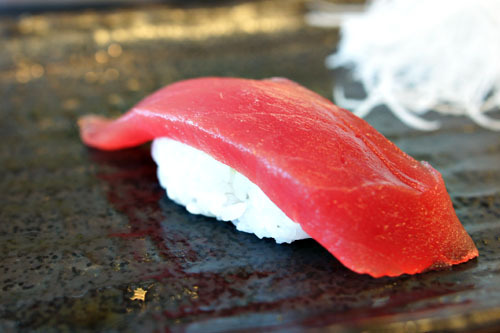 Along with the maguro came its overweight cousin, toro. This was a solid, though not standout example of tuna belly, with an appropriately fatty flavor attached to a melt-in-your-mouth consistency and fortunately little sinew. Aoyagi was quite nice, with a soft, spongy body and a subtly sweet, saline savor that played rather well with the marked burn of the wasabi. Moving on from beer to sake, we ordered up a 300mL bottle of the Okunomatsu Tokubetsu Junmai Nama Chozo Shu [$15] from Fukushima. 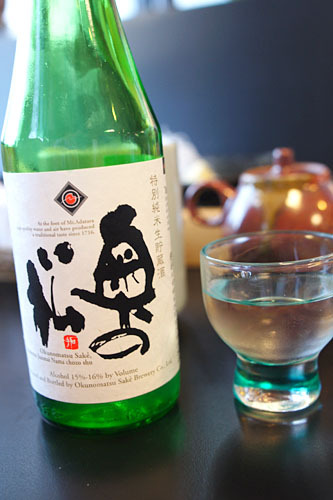 This was a pretty easy-drinking sake, with a crisp dryness accented by a touch of floral character. Smooth, but also a tad hot and spicy. 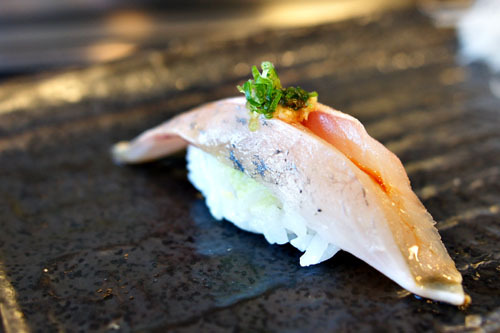 Aji's one of my favorites when it comes to sushi, and here it did not disappoint, with the Spanish mackerel conveying a delightfully mild brine that lingered long on the finish. Loved the tempering tang from the scallion and ginger, too. 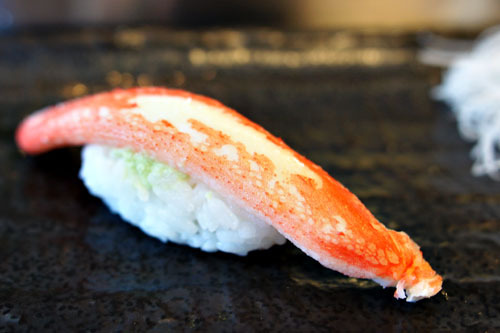 A rarity in nigirizushi form, snow crab was delectable with its sweet, juicy flesh that formed a great contrast with the relative austerity of the rice. Kinki fish was another hard-to-find neta. 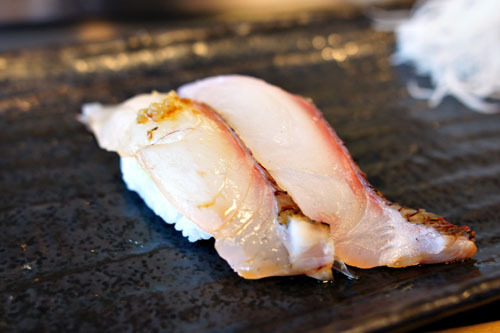 Also known as kichiji or rockfish, it showed off a slightly spongy, snappy, and chewy consistency that I found immensely enjoyable. Taste-wise however, the fish didn't really stand out. 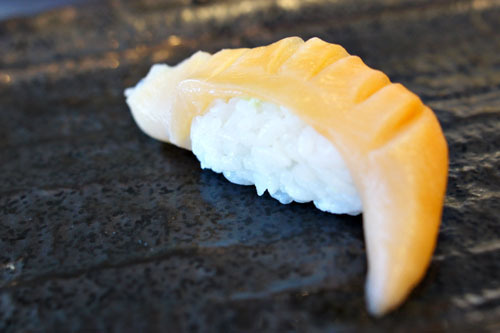 The amberjack, meanwhile, was also primarily about the texture: lush, creamy, palate-coating, dare I say unctuous even, with a bit of bite. 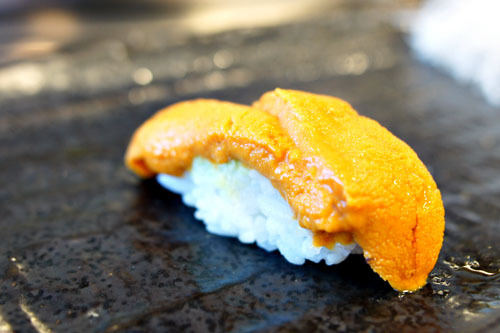 Uni was sourced from Santa Barbara, and was particularly sweet today. The wasabi, thus, really did a nice job in balancing out that sugariness. Albacore was one of the more interesting preparations that I'd had in a while. Usually the fish is served slightly seared, but we had none of that here. Instead, the tuna was creamy and cool, with a satisfying flavor that was heightened by a topping of what I believe was grated daikon. Here was a first for me. 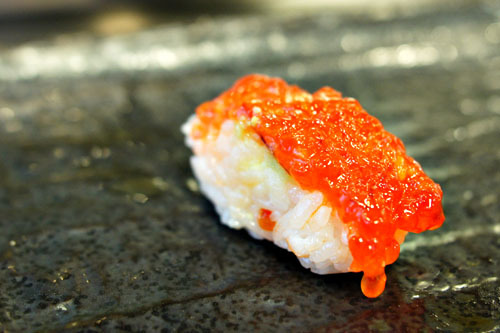 At first glance, this looks like some sort of ikura, or salmon roe, and indeed it is. However, unlike ikura, the sujiko is marinated in its original sack, resulting in a saltier, lingering, more in-your-face sapor. In fact, it almost reminded me of pressed caviar. Salmon was about what I expected: simple and straightforward in its lusciousness, with a slightly tendonous texture. Anago, on the other hand, was a surprise, and one of the better versions that I've had. 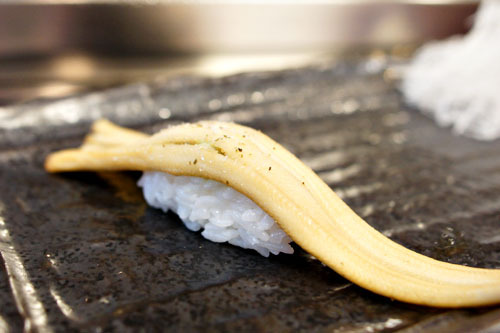 The eel showed off a fitting fishiness that was deftly countered by a touch of salt. At the same time, a whisper of sweetness served to ground the sushi. 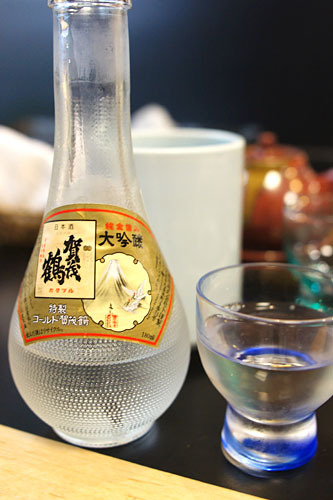 With the Okunomatsu all drunk up, we moved on to the Kamotsuru Tokusei Kinpaku Gold [$15], a daiginjo from Hiroshoma. 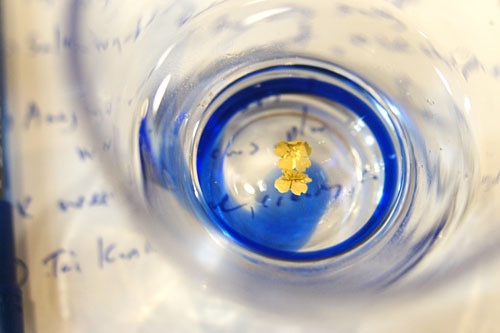 Kamotsuru was one of the first brewers in Japan to produce daiginjo-shu back in the early 1900's, and the company continues that tradition with this sweet, viscous, melon-tinged sake that features two cherry blossom-shaped gold flakes in each bottle (like a high-class Goldschläger!). 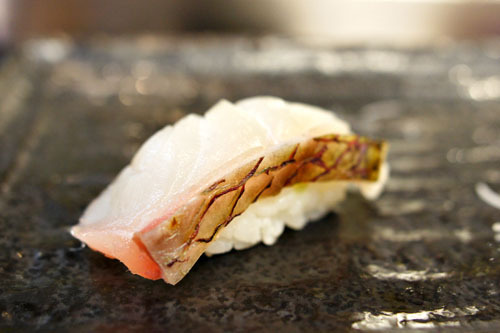 Konbujime refers to the kelp-treatment of fish, and here, the effect was a deeper, more complex, more concentrated flavor from the snapper. Very nice. 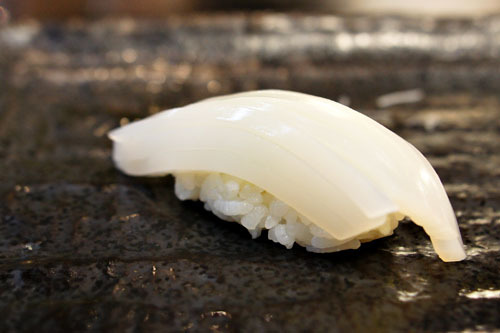 Squid conveyed its typical chewy-creamy consistency, along with a delicate flavor nicely finished by the burn of wasabi. 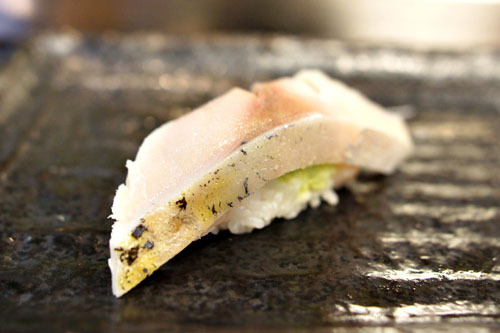 A meaty, almost fatty cut of mackerel, with a superb, creeping touch of fishiness that I rather liked. A surprisingly satisfying saba! Next was surf clam, which you don't see all that often. Here we're talking a soft, squishy texture joined by a delightful sweet brine. Two types of hosomaki. The first was filled with kanpyo, basically strips of calabash gourd, making for a sweet, crunchy eating experience. Meanwhile, the other roll conveyed a refreshing mintiness from the shiso that balanced out the sweet-sour-salty smack of the ume nicely. 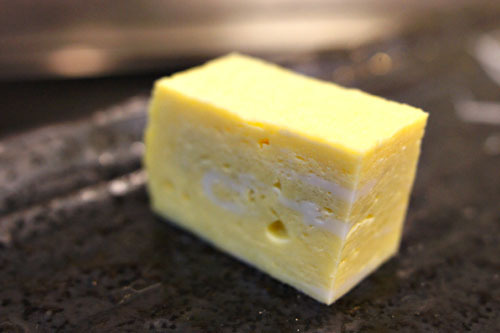 To round things out: a cool, eggy, slyly sugary tamago egg omelet. 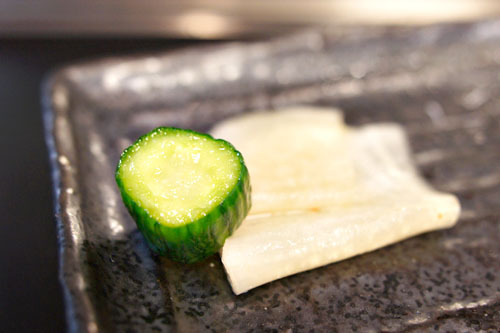 A final course from Naga-san: crisp, piquant cuts of kyuuri and daikon radish. I approached Shibucho with a bit of apprehension, but I'm happy to report that my trepidations were all for naught. This was some legit sushi to be sure--high quality, with a few unexpected twists thrown in for good measure. 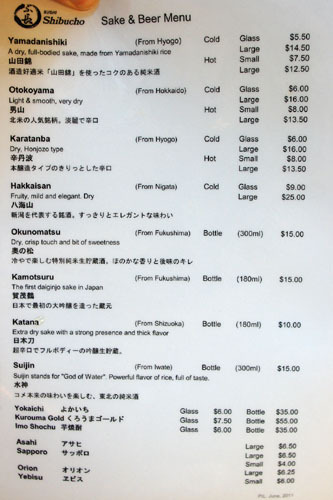 And at only $55.80 per person, Shibucho wasn't a bad value either. As such, I do not hesitate in calling this one of my strongest sushi experiences yet in OC. 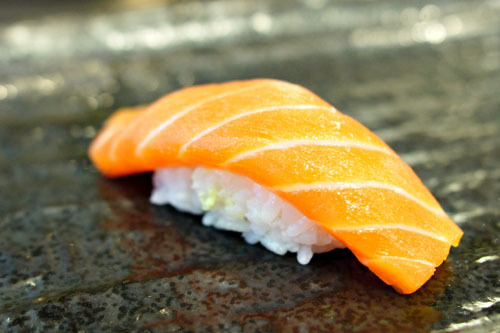 Local sushi fiends, you owe it to yourself to give the place a try; just be sure to sit at the bar, and trust the chef! If I have one Japanese meal in OC, should it be here or Ikko? Even though we visited 3 days after Urasawa I really enjoyed this. 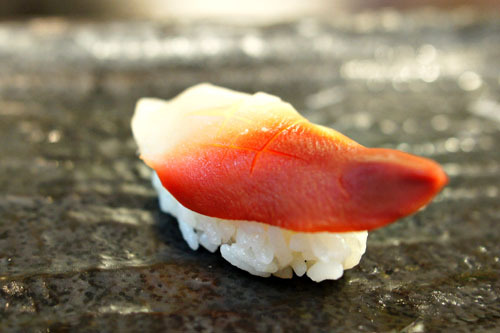 The Uni, Anago, and Saba were up there with the best I've had, and the price is hard to beat. Thanks again for coming out and sharing the sake. Big fan of this place. Haven't been in a few years but glad they are still performing at tip top shape. I went on a Saturday and there was a line of 8-9 people waiting at the door right before it opened (with reservations) and they turned everyone away after that. Hey Kev. Caught a repeat of Carson, 2 Dudes gave you a shout out (I'm sure you saw). Pretty cool! Darin: I'd have to give the nod to Ikko, given that it has some more interesting non-sushi dishes. Sam: I agree. Definitely check it out when you have a chance--it's near your hood. Roddy: Thanks again for setting up the dinner! I left pleasantly surprised as well.